Munich Airport opening line: We’ve been sitting for an hour or more here, up high, in the airport’s main food hall, which overlooks the duty free, clothes, electronics, accessories and souvenir stores below. A man finds himself in Berlin, with his father to collect the body of his sister who died from starvation. They start their journey indulging in excesses of food and drink, before they start to starve themselves. An American expat in London, about to enter a meeting, takes a phone call. The caller is a German policewoman. The news she has to convey is almost incomprehensible: the man’s sister, Miriam, has been found dead in her Berlin flat, of starvation. Three weeks later, the man, his elderly father, and an American consular official find themselves in an almost unbearably strange place: a fogbound Munich Airport, where Miriam’s coffin is to be loaded onto a commercial jet. 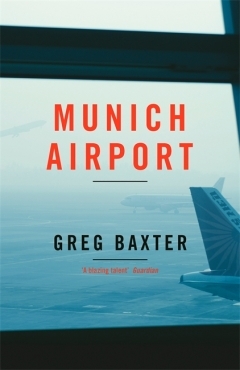 Greg Baxter’s extraordinary novel tells the story of these three people over those three weeks of waiting for Miriam’s body to be released, sifting through her possessions, and trying to work out what could have led her to her awful death. Munich Airport is a novel about the meaning of home, and about the families we improvise when our real families fall apart. It is a gripping, daring and mesmeric read from one of the most gifted young novelists currently at work. Each month I can choose three books to review from quite an extensive list, and so I base my selection on the blurb which can be found on the back of the book. The last line of the blurb reads as follows: It is a gripping, daring and mesmeric read from one of the most gifted young novelists currently at work. I must say that I do not agree with Greg Baxter being a gifted novelist. I found the book compelling to read but not in a good way. There are no chapters and no paragraphs, making it long winded and difficult to follow. The book is an internal monologue worthy of any Shakespearian play. Frankly, the only thing I could relate to in the book, which ended without any conclusion, was the airport itself, as I recently found myself spending quite some time at Munich Airport. I would not add this book to my list of ones to read, or the author as one to follow. I found the book tedious to say the least! Thank you Tandy for your honest book review. I always appreciate how real and raw your blog is =) I will not add this book to my must-read list. I don’t think I’ve ever read a book in that sort of format! It does sound difficult to read!